*Is Trump a corrupt, illiterate Likud-aligned narcissist and total disaster for the USA and the world? Or is “the Don” a 3D chess playing “America first” guy who wants to expose the Deep State and maybe even end the Empire? *How can America rebuild its infrastructure and economy to benefit ordinary people rather than the .001%? *Could we soon see a long-awaited disclosure of secrets concerning anti-gravity, free energy, and an alleged ET presence on Earth? *How might the scourge of Zionist hegemony be purged from our shores (and the shores of Occupied Palestine)? *Is the FBI, along with a secret Houston grand jury, sitting on a pile of evidence concerning who really was behind 9/11? 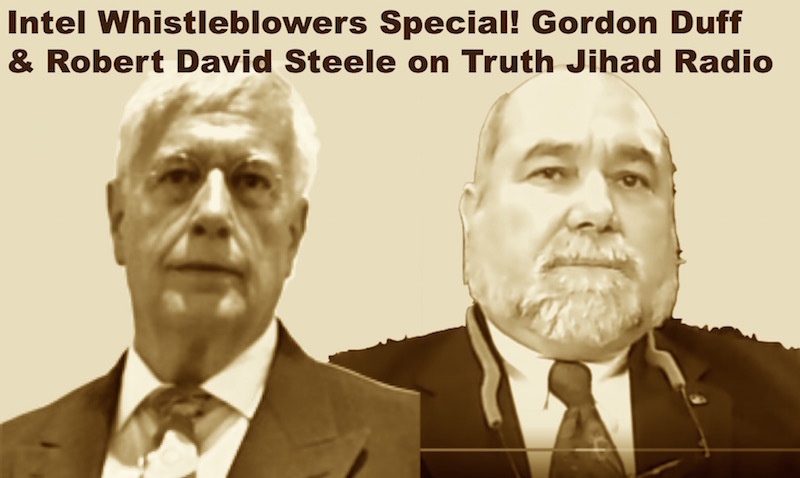 *Could Robert David Steele’s plan to bust up the two-party tyranny by running well-funded, closely-cooperating third-party candidates in the 2020 elections actually work? Ex-Marines Duff and Steele—two modern-day Smedley Butlers—are both smart, headstrong guys who don’t suffer fools gladly. Prior to this meeting they were at loggerheads over their conflicting views on Trump. But they seem to have emerged from their meeting with increased mutual respect…and a degree of optimism about the prospects for saving America. Note: I will be interviewing Robert David Steele live this Friday, December 7, 8 to 9 pm Eastern. This entry was posted on Tuesday, December 4th, 2018 at 8:09 pm	and is filed under 9/11, Anti-War, Censorship-Propaganda, Disaster Capitalism, Econo, Education, False Flag/Fake Terror, Freedom, Geopolitics, Human Rights, Israeli spying and influence, Kevin Barrett, News, Protest, Regime Change, Science, War Crimes. You can follow any responses to this entry through the RSS 2.0 feed. Gordon’s best interview for ages. Gordon needs to address geo-engineering if he wants to talk climate change.